Camellia is one of this year’s six Belles and like the other five, dreams of being chosen by the Queen as the favourite. This would mean living in the palace and working with the royal family and their court, the ultimate Belle goal. When Camellia discovers the Belles’ origins, she endangers not only her life but that of her friends. She quickly comes to realise Orleans is a malevolent city where the demand for beauty is so high nothing and no-one else matters. Soon all the Belles learn there is an evil side to the work they have been trained to do. Camellia must use her considerable Belle powers to rescue her Belle sisters and revive the ailing princess. She also needs to find a way to stop whoever is using the Belles’ magic with such deathly results. With little time to spare before the princess dies, just how far is Camellia willing to go with her Belle skills to save the people she loves? Will she find the personal sacrifices demanded of her too high a price to pay? This fast-paced and action-packed book is number one in a duology. 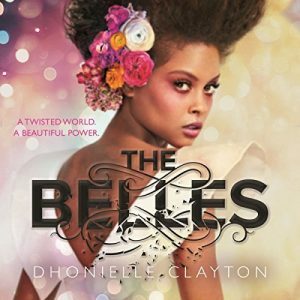 The author, Dhonielle Clayton, founded CAKE, a publishing company concentrating on presenting “compulsively readable fiction with a decidedly diverse bent.” The Belles’ heroine, Camille, is an African-American, as is the author. It’s 2018–time we saw more diverse writers and heroines on our library and bookstore shelves. If you are a reader who enjoys fantasy worlds, with magical elements and strong female protagonists who do what needs to be done to change their world, then this is a book for you.